Reproducibility is fundamental to scientific research. If you develop a new algorithm and use simulations/experiments to claim its superiority over prior algorithms, your claims are only credible if other researchers can reproduce and confirm them. The first step towards reproducibility is to describe the simulation procedure in such detail that another researcher can repeat the simulation, but a major effort is typically needed to reimplement everything. The second step is to make the simulation code publicly available, so that any scientist can review it and easily reproduce the results. While the first step is mandatory for publishing a scientific study, there is a movement towards open science that would make also the second step a common practice. I understand that some researchers are skeptical towards sharing their simulation code, in fear of losing their competitive advantage towards other research groups. My personal principle is to not share any code until the research study is finished and the results have been accepted for publication in a full-length journal. After that, I think that the society benefits the most if other researcher can focus on improving my and others’ research, instead of spending excessive amount of time on reimplementing known algorithms. I also believe that the primary competitive advantage in research is the know-how and technical insights, while the simulation code is of secondary importance. 4) Young scientists may learn how to implement a basic simulation environment by reading the code. 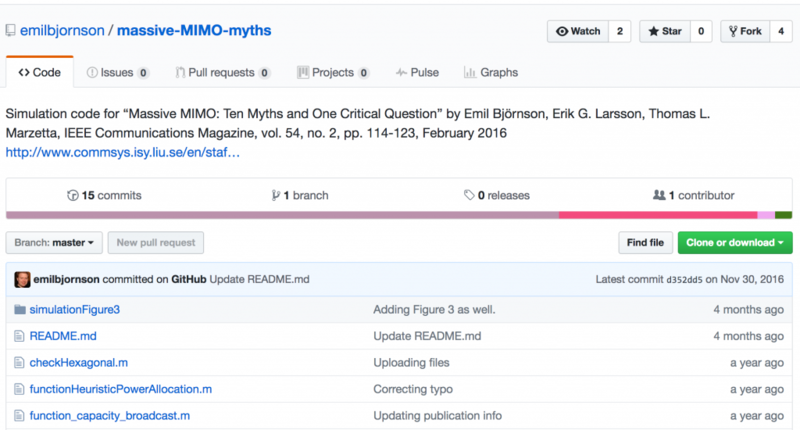 I hope that other Massive MIMO researchers will also make their simulation code publicly available. Maybe you have already done that? In that case, please feel free to write a comment to this post with a link to your code. Previous PostBook Review: The 5G MythNext PostMassive MIMO at 60 GHz vs. 2 GHz: How Many More Antennas? That’s a praiseworthy decision, thanks for sharing your work! I remember reading about initiatives that provide a toolchain that makes it possible to automate the entire simulation workflow, a bit like what npm-based project do. A commendable practice – we should all push for this (insofar the research contracts permit). Actually I have long argued that every paper should come with a Makefile that compiles all relevant programs from source, re-creates all the simulation results, generates all figures and compiles the paper itself. When will we see the availability of open datasets (e.g. channel or traffic measurements) in wireless communications? In other fields, there are several datasets (SNAP in network science, and lots of datasets, Netflix, Yelp challenges, and more in machine learning) publicly available under generous license conditions. Several of them in fact seem to be of commercial origin. Publicly available datasets could offer great value to the community, and potentially large impact for the data owners. Absolutely great. I wish all wireless communication researchers, specially the popular ones in the field, should make their implementation codes public as a means of reproduce able research. It is very generous to share extra research materials like simulation codes and data sets and etc with others. Young researchers specifically know how helpful this could be. I myself am very grateful to all the assistance that I have received from Prof. Bjornson with provided matlab codes in his Github and also his patience in replying E-Mails which is very generous. I wanted to represent my gratitude here.